Fall Greetings to all So Cal Flame Surfers! As we prepare for the holiday season, there are many reminders of giving thanks and recognizing that we have much to be thankful for. My thanks to you for the support you have shown to our chapter over the last year. Your participation in our meetings and special events, together with your generous support of Beads of Courage, have made 2018 a good year for SCFS. 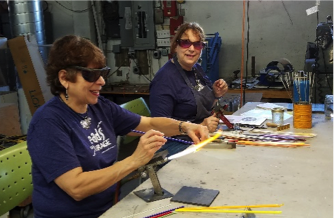 We had two great events in September at Pacific Art Glass. 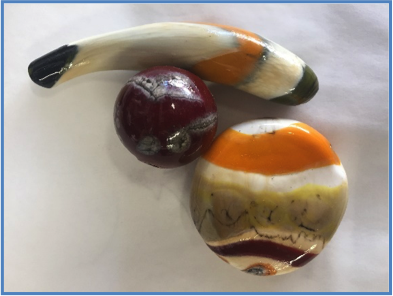 First, our general meeting featured a demo by member Kathy Spignese on making cabochons using special mandrels. Kathy also showed how to work with the new Lumiere Luster flakes from Jet Age Studio. This product produces an effect like dichroic glass, but at a fraction of the cost. We are organizing a group order of the luster flakes for members to get this material at a substantial discount. Come to our holiday party for details. 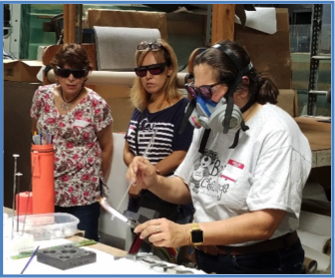 We also hosted an Open Studio event for the BOC 2018 Bead Challenge. Our members we joined by an enthusiastic crew of volunteers recruited by BOC board member Chrissy Peterson, polymer clay artist Corliss Rose, and a family from the BOC program. 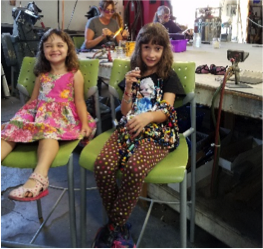 SCFS members made over 40 Courage Beads at the torch, and everyone joined in to make over 250 polymer clay beads for donation to BOC. In addition, over $600 was raised for BOC through purchase of beads, bead kits, and participation in BOC activities. Thanks to all that participated in this wonderful event. 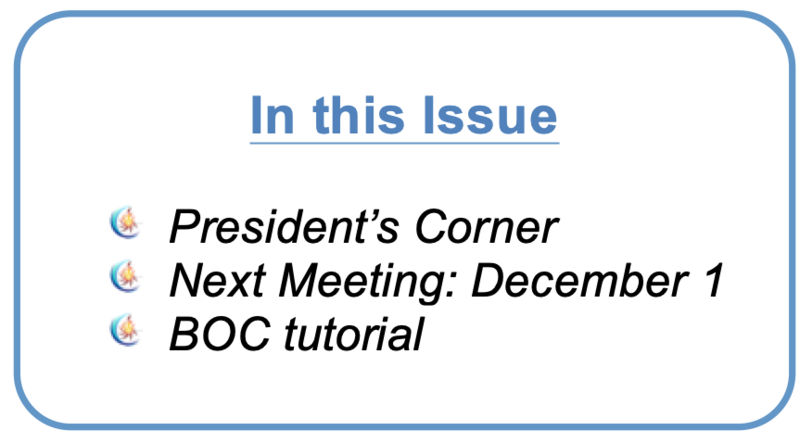 Our final event for 2018 will be our Holiday Bash meeting on December 1. We have a new location and several special events planned for this meeting. We will also have our largest raffle of the year at the meeting. I hope you can join us and use the occasion to renew your membership for 2019. See below for details. Our 2018 Holiday Bash will be held at Wendy Leys’ home in Tustin. Wendy’s newly remodeled Craftsman-inspired home provides a beautiful setting for our meeting. Please note the extended the meeting time to allow everyone plenty of time to eat and enjoy each other’s’ company. Bring a side dish or dessert to share; we will provide a hot main dish and drinks. Demo. Flame Surfer Charlie will show us how to blow hollow discs and long tube beads. She will show us the tools needed for the blowing and tongs to hold the hot beads to remove them from the blow pipe. They are a lot of fun to make and with practice, you should be able to make them too. Raffle. The holiday raffle will be the biggest of the year! Open only to current or new members. There will be many prizes, including tools, glass, and gift certificates. Grand prize will be a Millennium 10- liter concentrator! Member Gift Bag. All members coming to the meeting will get a special gift. Expanded Holiday Gift Exchange. We will have an expanded and more “interactive” gift exchange for this meeting. Please bring in a wrapped glass item of your creation, or a surplus tool, book or other item of interest to a glass artist. When it is your turn, you can either select a wrapped gift item, or “steal” a gift from one of the others. Beads of Courage Donation. Please remember to bring your Courage beads for donation at the meeting. Courage beads are always in short supply and BOC usually runs out of these special beads this time of year. Courage beads are those with a special theme, size, texture, or sculptural element (without exposed reactive glass). Your orphan beads make perfect Courage beads, so clean out your inventory and give encouragement to a child. I have included a holiday-themed tutorial at the end of this message for inspiration. For many, the holiday season is a time to indulge in special foods. This easy BOC tutorial is for a candy treat that won’t elevate your blood sugar or expand your waistline. Kids love candy, and beads from this tutorial will brighten their day any time of the year. The bright colors and texture of these beads are sure to bring a smile to kids of all ages. 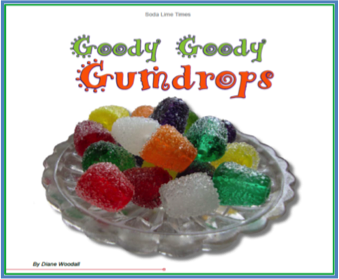 This tutorial is authored by Diane Woodall and is from her latest collection of BOC tutorials called “Hot Glass for Cool Kids, Volume 3”. The collection is available from Diane Woodall and Soda Lime Times. Get the tutorial here.